Most married couples intend to take a step forward into parenthood. Many marriages have the main purpose to have and raise kids. For parents, their kids are their biggest happiness. So, how about us –childless couple? Can we have a happy marriage life? Though there’s an increase in the amount of couple who choose childfree living nowadays, for me and hubby, being childless is not our choice but a real fact that must be accepted. My womb was taken during a surgery last year. It couldn’t be postponed any longer as my health worsening fast. Childfree married couple is still a minority in our society, that’s why meeting new people is never easy for me. I always face the same question and pity reaction when they finally know my condition. But I can say that I’m much stronger now. As Gede Prama said in his article ‘The Art of Healing’, suffering is a bell to remind you to come back home, to the home of peace. As long as I sincere and surrender, everything will be all right. As the time goes by, I don’t feel sadness anymore. The life keeps going on. Ellen L. Walker, a psychologist, has written a book titled ‘Complete Without Kids’. I haven’t yet read her book, but in one article she mentioned about a study result stated that Couple’s Happiness can be reached by simply relationship maintenance. I think we should do this. We don’t have kids to brighten our marriage life, but we can reach happiness in our marriage by making our relationship stronger. We can be happy in ‘different way’. Let me link this post to Blue Monday. 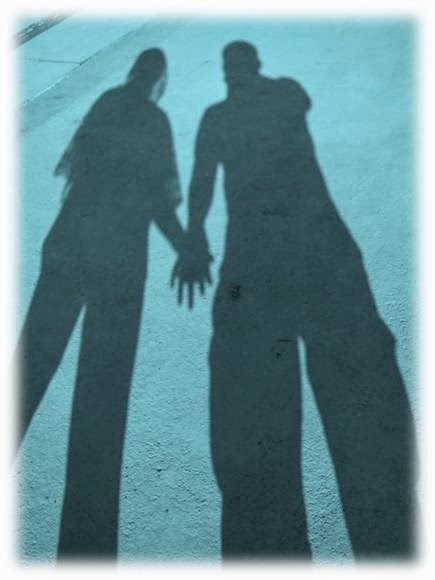 Those are shadows of us. Captured one sunny morning, a few weeks before the surgery held. My hubby keeps telling me that my health is his most concern –above all. He can accept to be childless as long as I can get my health back. I’m fortunate to have a caring husband like him. Of course you can be happy! Yes , this is wonderful , nice shade lovers ! Greetings ! And, he is fortunate to have you. Together, you two can find happiness. I think you are both fortunate to have each other. True love is hard to find, and you found each other. I say a whole hearted YES, you can be happy without children. And if it's meant to be, later on you can adopt children. I love your photo! You have a lovely husband and I wish you both a great and healthy life together, without others asking stupid questions. We can never understand why our lives are planned as they are. We were not promised roses, just accept what is and go on. For some reason, you were not supposed to bear children. That is not easy to accept, but it is life. Best wishes to you both. I believe a childless couple can be happy. As a couple, you have the choice to enjoy each other and adding angels in the family when you both are fully ready will be happier. semoga mbak Lina dan keluarga selalu di berikan lindungan,kekuatan dan kebahagian.. I really admire your very optimistic attitude. I know how hard it is on your part, but you are still looking on the positive side of things.